Adobe's announcement that it will cease perpetual license sales of Photoshop and move to a subscription only offering for the application will force many photographers to look elsewhere. Shooters who haven't already moved their workflow to Lightroom or Aperture will be revisiting these applications to handle their everyday post production tasks. And to be honest, I think that's the way it should go anyway. Except for those times you need to composite an image, Lightroom and Aperture are better suited for general photography workflow. Both applications provide organization, nondestructive editing, and output of Raw and Jpeg files. They use the natural language of photographers and are much easier to learn than Photoshop. And both are a better value. 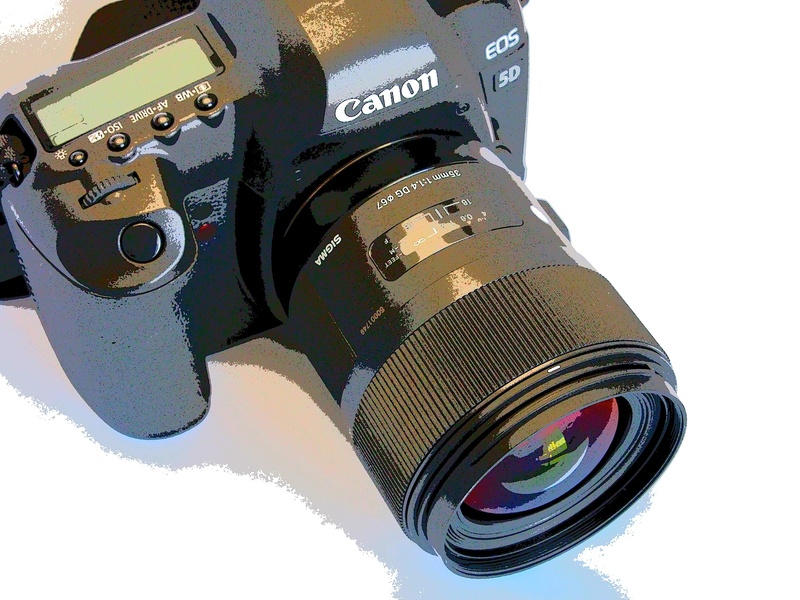 Many of us will miss Adobe Camera Raw, however. Its evolution will now move to the Cloud alongside its older brother, Photoshop. But for the moment, Lightroom remains both a standalone product that doesn't require a subscription, and is available in the Cloud. If Adobe is smart, it will maintain that dual citizenship. Meanwhile Aperture continues its leisurely stroll with timely Raw updates, but sporadic feature enhancements. For $79, Aperture is certainly the best value in the bunch. And for the majority of enthusiast photographers, and many pros, it has everything they need for the bulk of their work. 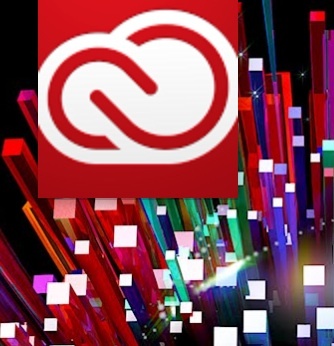 Aperture may receive additional attention as a result of this move by Adobe. As for me, I will, as needed, roundtrip to Photoshop CS6 when I require one of its unique features that isn't available in Aperture or Lightroom. But I won't be subscribing to Creative Cloud. It's just not a good match for this photographer. This week on The Digital Story: Photography Mashup, "Tools or Toys," joined by the hosts from Improve Photography and the Digital Photo Experience. This week I lead the conversation with Jim and Dustin from Improve Photography and Rick and Juan from Digital Photo Experience for a podcast mashup where we tackle the burning question: Are these tools or toys that we desire? You can also download the podcast here (48 minutes). Or better yet, subscribe to the podcast in iTunes. You can support this podcast by purchasing the TDS iPhone App for only $2.99 from the Apple App Store. The May 2013 photo assignment is "Food". Take a look, then tidy up your photo workspace. To learn more about using Aperture and iPhoto together, visit my Using iPhoto and Aperture Together on lynda.com. Also, take a look at our Aperture 3 Learning Center. Tons of free content about how to get the most out of Aperture. 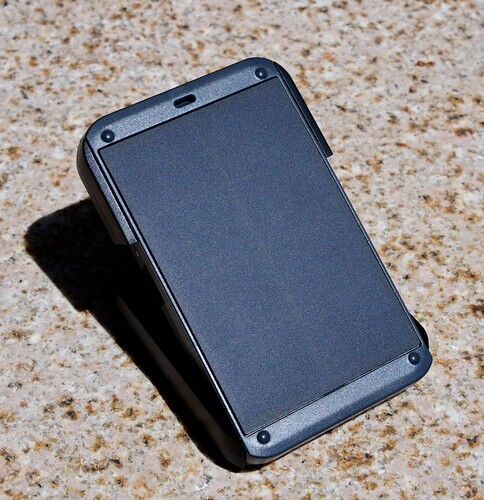 The Waka Waka Solar Charger combines two functions I often need when working in the field: unlimited portable light and the ability to recharge my iPhone. 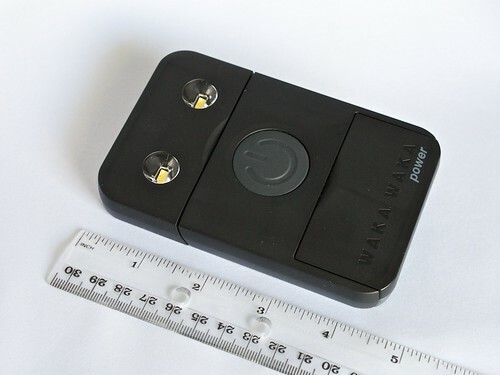 Even though it's only about 4" long, the Waka Waka houses 8 high efficiency solar cells, a battery, two LED lights, USB charging out, and mini USB charging in (for when you don't have solar available). The dual lamps have three brightness settings: 100 percent output that runs for 20 hours off a full charge, 50 percent for 40 hours, and 25 percent brightness that's good for 100 hours. Even at 25 percent output, you can read a book. Impressive. The Waka Waka is very compact and extremely light. The light can be positioned using the built-in stand, mounted on a bottle for elevated light, or hung via a string. I've used it in my tent and on a camping table. And thanks to the multi-positionable stand, I can angle the light exactly how I need it. 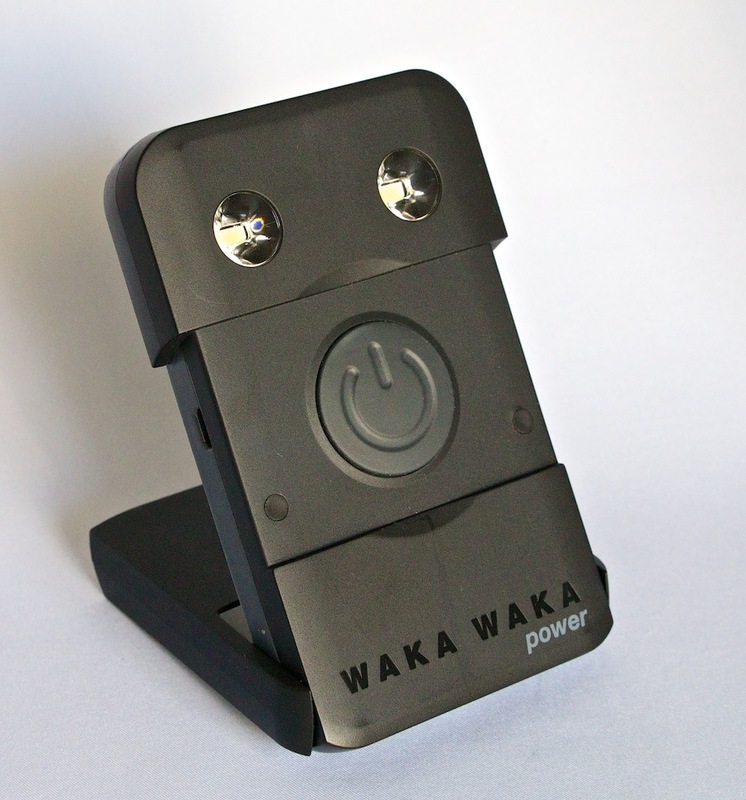 To fully charge the Waka Waka via solar takes about 8 hours. But most of the time I only depleted 25 or 50 percent, requiring just a few hours to charge it back up. There are four green LEDs on the top of the unit that display its current amount of charge. Recharging the Waka Waka. The solar cells are on its back side. I devised a holder for my backpack that's made of mesh and allows me to charge the Waka Waka during the day while I'm hiking. Depending on the brightness and angle of the sun, I've replenished up to 50 percent while on the trail. 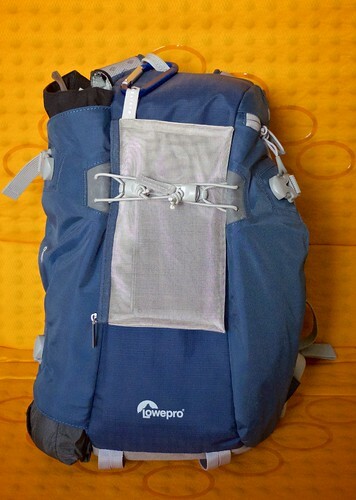 I can charge the Waka Waka while hiking by using this DIY mesh pouch. I've also recharged my iPad mini and iPhone using this device. It drains the battery faster than using the lights, but adding 50 percent more service to my iPhone while backpacking is wonderful! 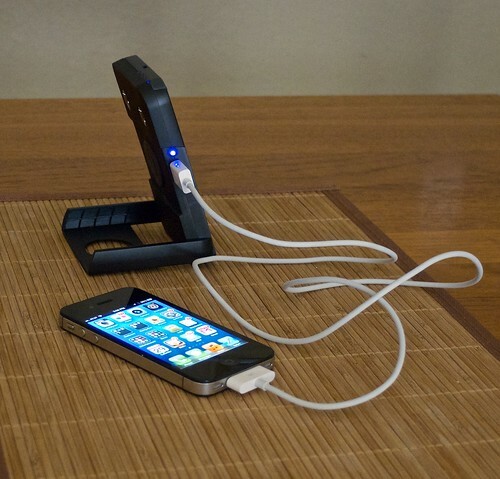 In fact, I recommend carrying two units: one for lighting and the other for recharging mobile devices. The Waka Wakas are available in two colors: black and yellow. I have one of each, which makes it easy to tell them apart. Charging my iPhone with the Waka Waka. The devices cost $79 each with free shipping in the US. They fit easily in a camera bag, backpack, or glovebox. The solar cells are surprisingly efficient, and the output is impressive. If you're looking for nimble solar power station, I would definitely investigate the Waka Waka. I never leave home without mine. Panorama photography is more popular than ever. The ability to sweep your mobile phone or compact camera and capture 180 degrees of a scene is both easy and compelling. 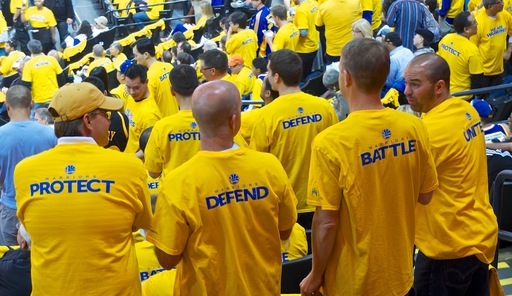 Warriors win Game 6 of the first round of the NBA playoffs at Oracle Arena in Oakland, CA. Photo by Derrick Story. Click on image for larger version. Panoramas do an excellent job of showing us more of a location, but don't underestimate their storytelling power either. 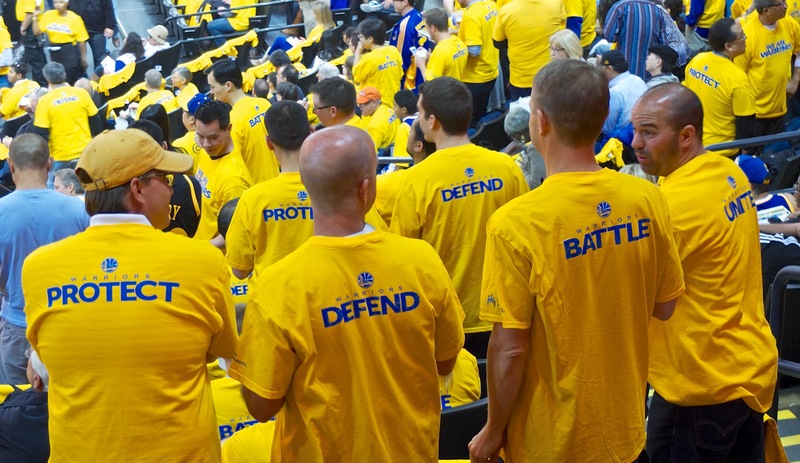 In the case of this image, captured at Oracle Arena right after the Golden State Warriors won Game 6 of the NBA round 1 playoffs, you're able to join participants in the stands and see what they were experiencing. I often shoot panoramas with my iPhone 4S, but I used the Fujifilm X-20 camera for this shot. It also has an excellent panorama mode in the ADV menu. Regardless of which device you have, keep in mind that panoramas aren't just for vacation scenics. They can capture the energy of human drama too. The thing about compact cameras is that they don't attract attention. 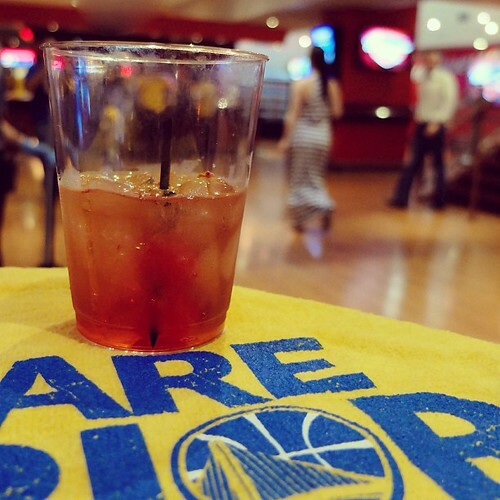 I'm hanging out in the club at Oracle Arena before the Warriors game with the Fujifilm X-20 taking pictures and enjoying the atmosphere. For this shot, I used the Pro Focus setting in the Adv mode to create the soft background. We once needed DSLRs to create this effect. For the March 2013 Photo Assignment, TDS shooters saw the world through monochrome glasses. See for yourself in our gallery, Black & White. And which one will be the SizzlPix Photo Assignment Pick of the Month? 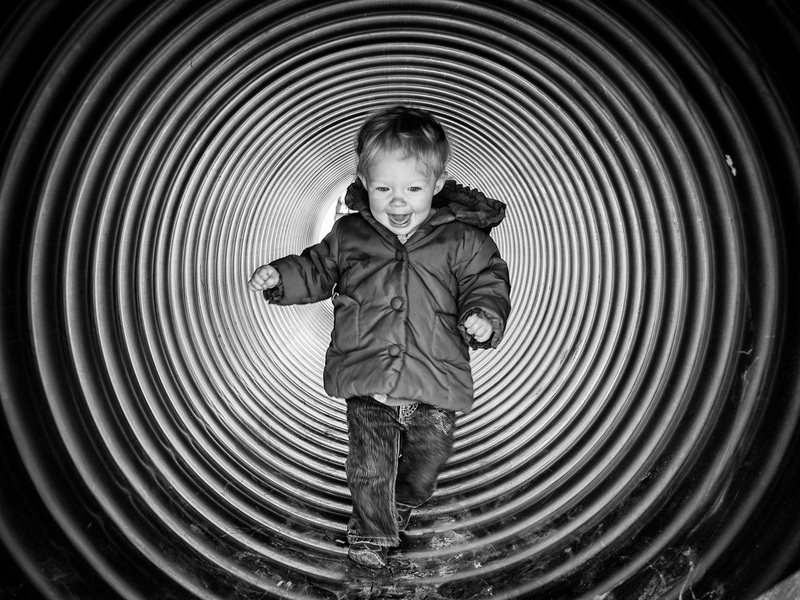 "Here's a photo of my daughter running through a culvert pipe at an orchard playground, " wrote Oliver Rutherfurd. "I went head-on with the shot as that was most practical. Plus, that was the feeling feeling I was looking for -- front and center, coming out of the tunnel, surrounded by the pattern of circles." 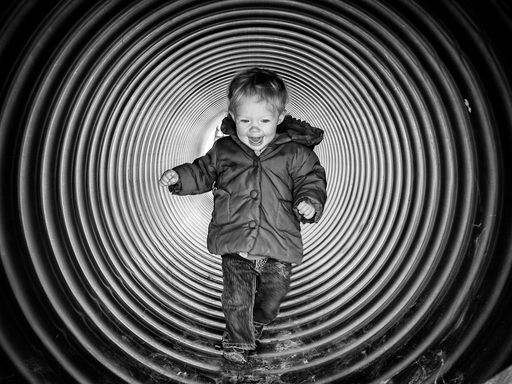 See all of the great images from this month's assignment by visiting the B&W gallery page. The May 2013 assignment is "Food." Details can be found on the Member Participation page. Deadline is May 31, 2013. No limit on image size submitted. Please follow the instructions carefully for labeling the subject line of the email for your submission. It's easy to lose these in the pile of mail if not labeled correctly. For example, the subject line for this month's assignment should be: "Photo Assignment: May 2013." Also, if you can, please don't strip out the metadata. And feel free to add any IPTC data you wish (These fields in particular: Caption, Credit, Copyright, Byline), I use that for the caption info. Gallery posting is one month behind the deadline. So I'm posting March 2013 at the end of April., the April gallery will be posted at the end of May., and on and on. Good luck with your May assignment, and congratulations to all of the fine contributors for March. Photographers who shoot Raw often don't realize their camera might have a powerful image processing function that creates Jpeg variations of those Raw files in camera. There are many advantages to this capability. For mobile shooters, it eliminates the need to capture in Raw + Jpeg. You can shoot in Raw, convert the images you like to Jpeg in-camera, then send those pictures to your iPad or iPhone for sharing. This approach saves space on the memory card and allows the camera to empty the buffer faster. Creative photographers have lots to play with here too. Most cameras that support Raw processing (such as the Olympus OM-D and Fuji X20) allow you to add effects during conversion. The sample image in this article is a Raw file converted to Jpeg in an Olympus OM-D using the Key Line Art Filter. I still have the original Raw that I can process normally on my Mac at a later date. The trick is to learn how your camera handles Raw processing. It's usually an option in the Playback menu. On the OM-D, for example, you press the OK button while viewing a photo. An option appears labeled JPEG Edit. Press OK again and the camera will convert the Raw file to Jpeg and add it to your memory card. The secret with the OM-D is understanding that the file will be processed with the current camera settings. So if you want to apply an Art Filter, for example, then set that up before you process the Raw file. The result will be a Jpeg with the Art Filter settings applied. 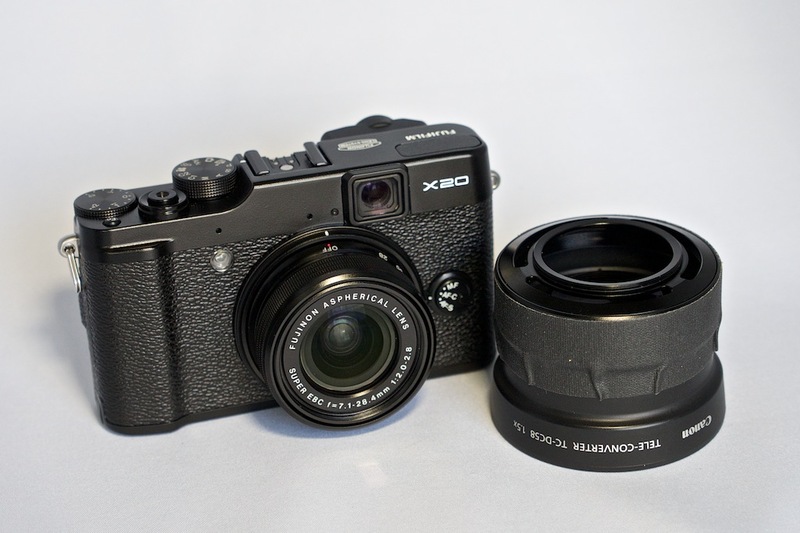 On the Fujifilm X20, the options are presented to you when you choose Raw Conversion from the Playback menu. You have options for Film Simulation (my favorite! ), color, exposure, noise reduction, and even push/pull processing. Check your camera's manual for its approach to Raw processing. Once I convert the Raw file to Jpeg, I can send it directly to my iPad via the Toshiba Flash Air Card using Olympus Image Share iOS app that ignores Raw files on the card and shows me only the Jpegs. Bottom line, if you love to shoot Raw, but sometimes need Jpegs, in-camera Raw processing might be the perfect workflow for you. This is the kind of stuff I write about in iPad for Digital Photographers -- now available in print, Kindle, and iBooks format. This week on The Digital Story: The gorgeous Sigma 35mm f/1.4 Art lens, creating a Frankenzoom, release of iPad for Digital Photographers, and SizzlPix winners! 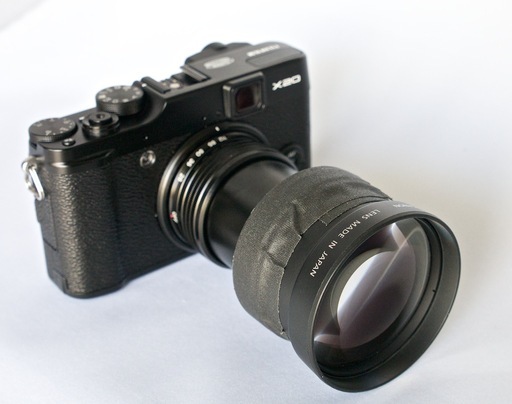 Story #1 - The Sigma 35mm f/1.4 DG HSM Lens - I've been testing this beautiful chunk of glass on the Canon 5D Mark II, and I have to say, I love this lens. It's sharp and soft, all at the same time. What do I mean? Well, where you put the focus the image is crisp, but when shooting wide open the tail-off to softness is just beautiful. Take a look at the Lady Victoria portrait captured with the Sigma 35mm at f/1.4 on the Canon 5D Mark II, and see for yourself. Story #2 - Frankenzoom - By now, you know that I hang on to optics, even if the camera they are designed for no longer works. When I needed to extend the optical reach of the zoom lens on the Fujifilm X20 compact camera for a recent NBA game (as a spectator), I found a 1.5X Canon teleconverter and mounted it on the X20. By doing so, I was able to extend the zoom from 112mm at f/2.8 to 168mm with no light loss. Story #3 - iPad for Digital Photographers is now shipping. I just received my print copy today, and it looks great. Please help support our virtual camera club and order yours today. It's $14.73 on Amazon.com. It makes a great gift too! Story #4 - SizzlPix Pick of the Month! Congratulations to Mark Steven Houser, Kevin Ned Miller, and Phil Fisher, our recent SizzlPix Pick of the Month for Long Exposure, Self Timer, and Furry Friends Photo Assignment. Please send me mail, and we'll get your SizzlPix in the works. The April 2013 photo assignment is Architecture. Make Your Photos Sizzle with Color! -- SizzlPix is like High Definition TV for your photography. SizzlPix Spring Sale - 25% Discount! Offer good on orders placed by April 30. Again, "TDS" or "The Digital Story" in the comments space. Of course, they will honor the discount for all TDS listeners and readers, including those who've received SizzlPix samples.